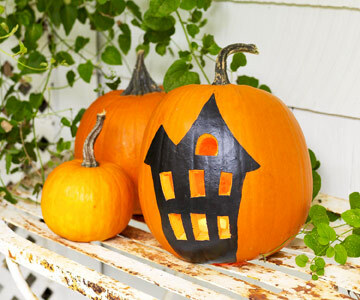 Set a bewitching scene inside or out with jack-o'-lanterns in whimsical, easy-to-paint designs. Little ghost-face lanterns lend a ghoulish glimmer to the mantel. 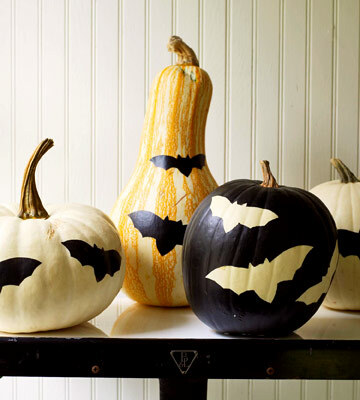 Here's how: Hollow out pumpkins (see tips below), then paint each one white, including stems. Use a grease pencil to draw three circles for the face, varying the shapes of the eyes and mouth on each to give the pumpkins personality. Carve out. 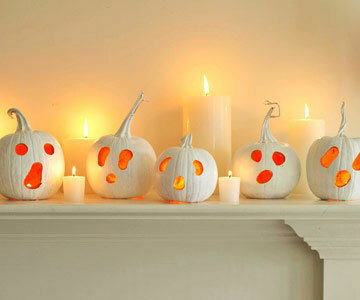 Place a small votive inside pumpkins to illuminate. —To remove grease pencil markings that are visible after carving, wipe with a little Goo Gone on a paper towel. —To Carve: Hollow the inside by cutting a 3-inch hole in the bottom with a serrated craft saw. Scoop out pulp and thin inside walls with a large spoon until shell is 1 inch thick. —The Paint: Acrylic paint (available at craft stores) comes in tubes and small bottles, dries quickly, and won't peel off. Always clean paintbrushes with water after every use because the paint quickly hardens on the brush tip. Let loose with these nocturnal creatures, which set an eerie mood indoors. Draw swooping bat shapes of all sizes on paper. Cut out the bat shapes, and save the paper they're cut from, keeping it intact. Paint within the edges of the stencil, or paint around the cutouts to make images from the negative space. Up the fear factor on fright night with a brightly lit haunted house. Draw a paper guide in the shape of your house, then cut out windows using scissors or a flat blade. 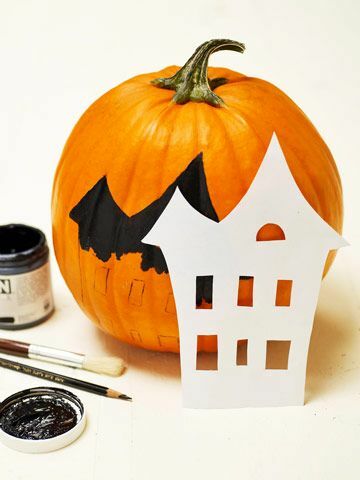 Then, stencil your house onto the pumpkin. Carve and paint along your guiding lines. 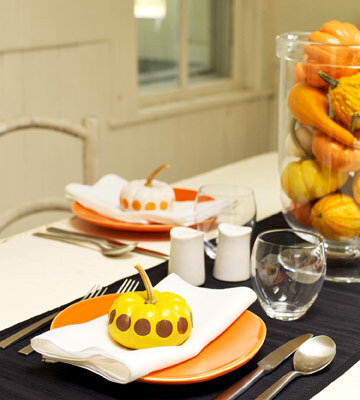 Give the table a spirited touch by embellishing mini pumpkins with bold dots. Here's how: Paint miniature pumpkins the color of your choice and let dry. 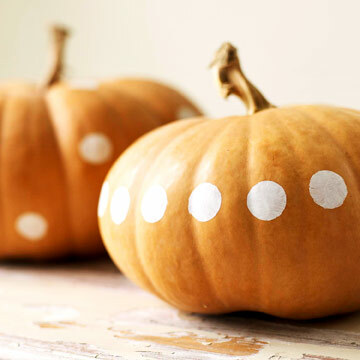 Lightly press masking tape around the pumpkins to make a straight horizontal guideline for dots. Indicate with a grease pencil the placement of each dot above the tape, before removing. Trace a small circle at each marking. Paint the circles a contrasting color—for example, try brown dots on yellow, and orange on white. 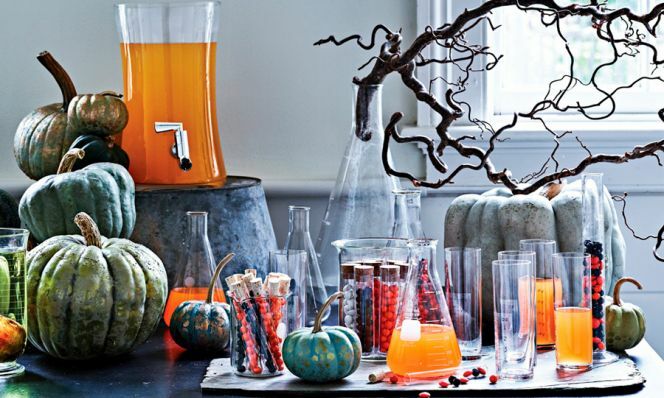 Create an enchanting centerpiece of mixed seasonal offerings. 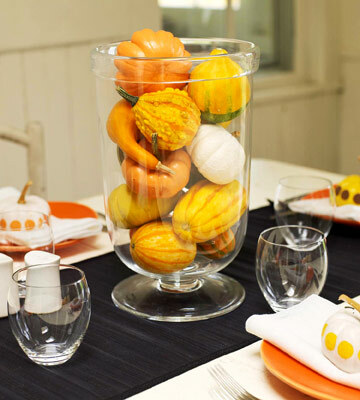 Here's how: Fill a large glass hurricane or vase with a selection of small gourds and pumpkins in different shapes. For a little something extra, paint a few gourds—we used bright orange and white and left the stems natural. 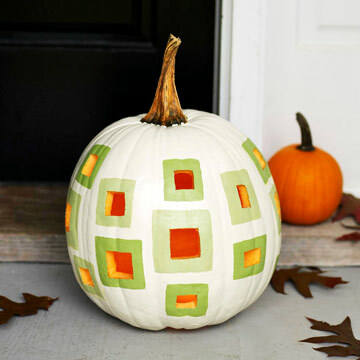 Geometric-patterned pumpkins make a modern statement on the front porch. Here's how: Paint each pumpkin white except for the stems. For green cutouts, draw freehand different-size squares with a grease pencil, allowing at least 2 inches between each (squares don't have to be aligned). Carve out windows using a serrated craft saw and then paint a lime-green border around each one. 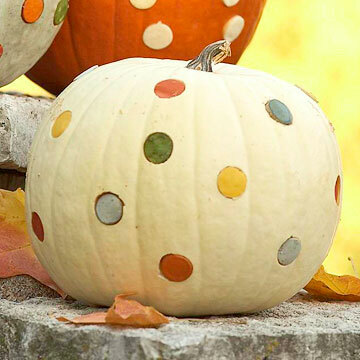 It's easy to dress up any pumpkin or gourd with a pattern of playful dots. Here's how: Choose large orange gourds. Follow instructions for Setting Pretty (slide 6). Allow an inch between dots and fill in circles with white paint. 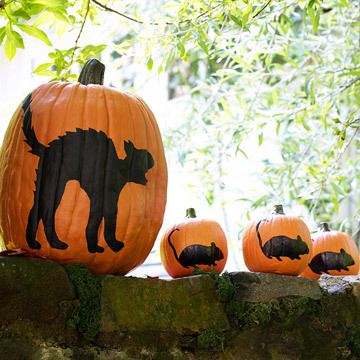 Add a hair-raising parade of critters to the front of the house. Here's how: Download Halloween clip art of a cat and a mouse from clipartguide.com or another clip art Web site. Print, cut out, and tape clip art onto each pumpkin. 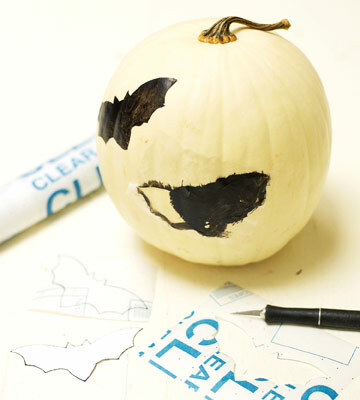 Trace shape onto the pumpkin with a grease pencil. Remove taped clip art and paint silhouette black. Harvest-hued dots are spot-on festive decor. Here's how: Paint the entire pumpkin white, except the stem. Let dry. Use an apple corer to randomly punch circles into the pumpkin—punch carver about three-quarters of the way through. 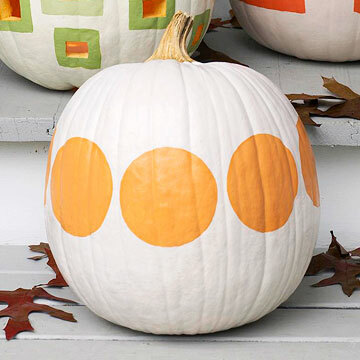 Choose bright, seasonal colors to paint the punched circles. A stripe of bold circles rounds out the holiday look. Here's how: Paint the entire pumpkin white, except the stem. Let dry. Lightly press two strips of masking tape around the pumpkin to make horizontal guidelines. Place one strip one-third from the top, the second one-third from the bottom. Freehand draw medium-size circles (or trace bottom of a can) between the tape strips. There are no set rules—space circles 1 inch apart or vary the distance. Paint each circle orange. Let dry and remove masking tape. 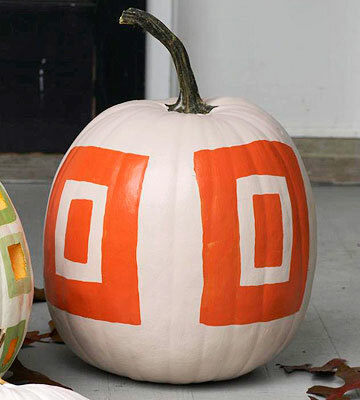 Graphic geometric shapes put a contemporary spin on your pumpkin. Here's how: Paint the entire pumpkin white, except the stem. Let dry. With a grease pencil, trace large rectangles around the pumpkin, leaving about 3 inches of space between each. Trace two smaller concentric rectangles inside the large rectangles. Paint the smallest rectangle and the area between the largest and medium-size rectangles orange. 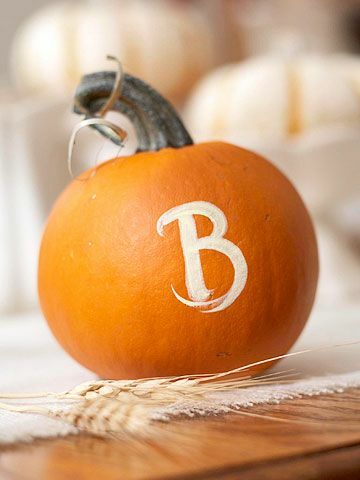 Try a monogrammed mini pumpkin as a place setting on a table. Here's how: Choose a font on the computer. Enlarge, print, and cut out the letter of your first or last name (or customize with your guests' initials). Tape the letter to the pumpkin with masking tape. Use a grease pencil to trace the letter. Remove the masking tape and fill in the stencil with black or white paint. Originally published in the October 1, 2008, issue of Family Circle magazine and on FamilyCircle.com.